Nicolas “Sparth” Bouvier, has been an active Artistic Director and Concept Designer for the gaming industry for over 15 years. In Structura 2, he delights us with what he has been imagining for the last three years since the release of his first best selling book, Structura. This visually stunning book includes images from video games DUNE, Assassin’s Creed, Rage, and Halo, over fifteen new gorgeous books covers and never before published personal science fiction pieces that will have your imagination running to the future! Not to ignore the past, Sparth also shares his world of fantasy art pieces influenced by medieval times. 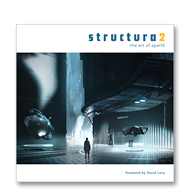 In addition to the amazing images that you will want to devour over and over, Sparth shares his expertise with several step by step tutorials focusing on specific Photoshop techniques using custom brushes, custom shapes, clone stamping and the smudge tool, to name only a few. 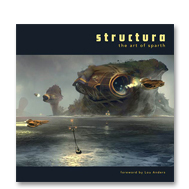 Be swept away into the imaginative and gorgeous world of Sparth’s imagination and then pick up a few tips to assist you in improving your digital artistic knowledge and visual communication skills. Categories: Books, we made too much on the reprint. Tag: sparth.